Check back here often for updated FAQs. If you have any questions, don’t hesitate to leave a comment below, use the form under Contacts & Links, or email us at boring.art.conference@gmail.com with any queries. Visiting from out of town? Contact us for a pdf information booklet about travel, accommodations, and things to do and see in London while you’re here. 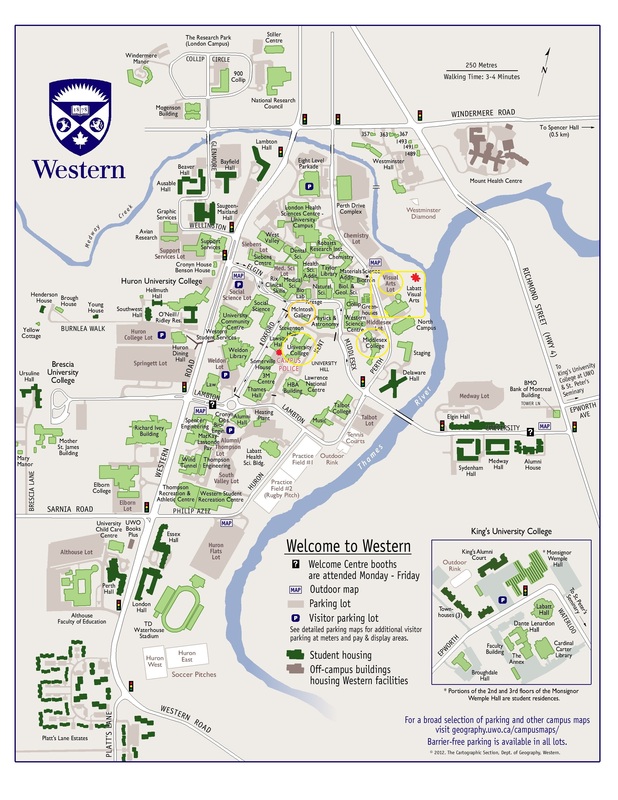 Where is Western University, and how can I get there? Western University (formerly known as the University of Western Ontario), is located in the city of London, Ontario, Canada. Attendees can fly directly into London International Airport (YXU) using Air Canada, though it is often more affordable to fly to Toronto Pearson and either drive, bus or train to London from Toronto. Attendees can travel from Toronto Pearson by cab or bus/subway to downtown Toronto, where they can connect with either Greyhound or VIA Rail. Alternatively, Robert Q Travel and Air Bus will travel directly from the the Toronto Pearson airport into London. London is about a 2-hour drive from from Toronto, a 3-hour drive from Buffalo, and a 2.5-hour drive from Detroit. There are a number of ride-share programs and groups from Toronto: To TO and Back and London – GTA Rides are two popular facebook groups where attendees can connect with drivers. Greyhound and VIA Rail travel through London from a number of locations, with Greyhound often offering the more affordable routes. There will be a free bus traveling from Toronto to London and back to Toronto on March 20th for the Western Open Studio event. For conference attendants who are wanting to come to Western’s Open Studios on March 20th but find yourself without a car and too broke for a greyhound or via rail, worry no more. The FREE BUS leaves Mercer Union at 1:30pm and returns at 9:30 that very same night. Where can I stay in London? Accommodation and travel to London is the responsibility of the registrant, but will will provide you with information about possibilities for each. How much time do I have to present? Panel chairs will be keeping all presentations to the strict time frame of 20 minutes. A question-period of roughly 10 minutes will follow. A 20-minute presentation works out to a paper of approximately 7 pages. I am interested in attending as an observer/audience member, but not as a presenter. Is this possible? Of course! Undergraduate and graduate students, post-doc’s, faculty, people from the community, professionals; everyone is welcome to attend the conference’s keynote address, panel sessions, and Professional Panel. We hope that many graduate students will attend to learn from, engage in, and contribute to what will be fruitful discussions about art practices and theory. We simply ask that both presenters and attendees register for the conference so that we can provide appropriate catering and printed material. Please go the the REGISTRATION page, or email us at boring.art.conference@gmail.com to let us know you plan to attend. Registration includes access to the full day of the conference on March 21, 2015. The conference will consist of a lecture, panels sessions with graduate students from across Canada and the United States, and a Professional Panel. Snacks and refreshments will be provided on the day of the conference. Accommodation and travel to London is the responsibility of the registrant, but will will provide you with information about possibilities for each. The purpose of registering is to help us know how much food needs to be ordered for the event, how much informational material should be produced, and to know our audience to help with the organization of future conferences. What campus buildings will I need to know for the conference? We would like to acknowledge the organizers of (Re)Activating Objects: Social Theory and Material Culture (Western’s 2013 Visual Arts Graduate Conference). Cierra Webster and Samantha Angove anticipated most of these FAQs, and left an amazing legacy in the form of the Holy Grail of Conference Guidebooks. Boredom could not have happened without their hard work and thoughtful archiving.